Manchester United swept into the EFL Cup semi-finals with the kind of buccaneering display missing from their recent history. This was fast and ruthless and surely had Jos� Mourinho beaming. The Portuguese�s side were unstoppable and at United the hope will be this proves the moment it all clicked for him and his players on an evening when the tone was set from the opening moment. The feelgood factor was continued when United were drawn to play third-bottom Hull City in January�s two-legged semi-final. Mourinho, who watched the match from a secret location inside Old Trafford after he accepted a one-match ban for his antics in the fixture between these two clubs three days earlier, said his side�s display had given him a feeling of �real happiness�. �I think we are in the right direction, we played very well and that makes me happy,� said United�s manager. �One of the things I proposed to myself was to come to a club like Manchester United and play the kind of football that people want. It�s Man U tradition. At last United had the kind of flying start they had allowed West Ham here on Sunday and previously granted Fenerbahce and Chelsea, as they gained the lead within two minutes of kick-off. Rooney and Henrikh Mkhitaryan were the creators as the captain fashioned a slick swivel-and-pass to the Armenian, who then played a sweet left-foot back-heel into Zlatan Ibrahimovic�s path and the Swede dinked over the onrushing Adri�n. The goalkeeper cleaned the No9 out as he scored, though within a few moments the 35-year-old was on his feet. The Hammers were fortunate to avoid going two behind after a similar United move. Rooney again drifted deep and took over. This time the pass that sliced the visitors open found Ibrahimovic: twice he blazed at Adri�n and twice it was repelled, and when the ball came to Anthony Martial he overcomplicated things. Next up during the breathless opening Ibrahimovic wheeled along the right and hit a cross that Winston Reid deflected for a corner. To cries of �Rooney, Rooney� � the first such heard in the stadium for a while � the 31-year-old trotted to the right quadrant and delivered the dead ball. From this West Ham broke, but Sofiane Feghouli needed too much time and was dispossessed. Mourinho�s men continued to come at West Ham in a red blur, with Rooney leading the charge. A corner from Slaven Bilic�s team became a United attack as Antonio Valencia raced upfield and fed Martial. He careered at Pedro Obiang, propelled by a frightening intent, and the midfielder was forced to flatten the Frenchman but Mike Jones adjudged the offence to have taken place outside the area. From the resulting free-kick Rooney went close to goal No249 for United and equalling Sir Bobby Charlton�s club record with a dipping shot that had Adri�n scrambling before steering it away. Mkhitaryan, Martial, Rooney and Ibrahimovic were terrorising the visiting rearguard and Michael Carrick prodded and probed behind. The Rooney-Ibrahimovic partnership, in particular, was performing in the manner Mourinho will have dreamed off when recruiting the Swede in the summer. West Ham were rocking and the only way they might equalise appeared via a mistake. 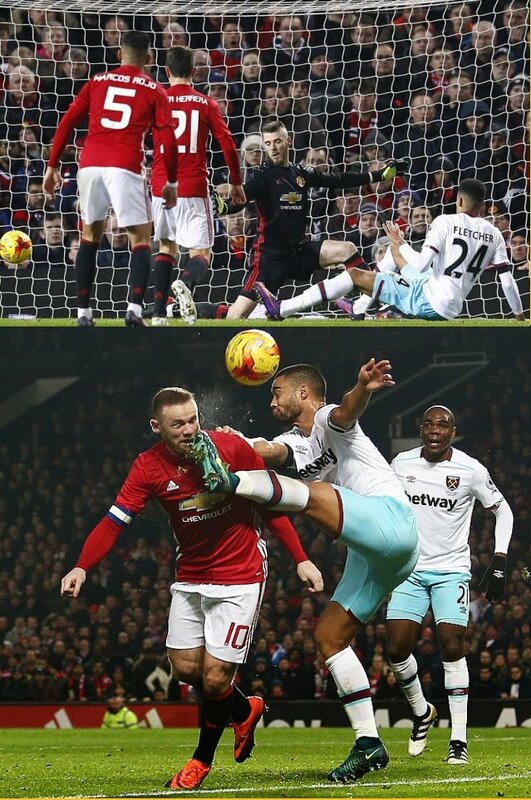 So it proved, as Dimitri Payet�s shot was spilled by David de Gea and in came Ashley Fletcher for an unlikely strike. The centre-forward departed Old Trafford for east London in the summer and so the travelling fans gleefully informed their opposite numbers that he had done so because they are not very good � though the language employed was industrial. Each manager had made five changes from Sunday�s 1-1 draw. For United out went Matteo Darmian, Paul Pogba, Juan Mata, Jesse Lingard and Marcus Rashford. In their place were Luke Shaw, Carrick, Mkhitaryan, Rooney and Martial. Bilic swapped Darren Randolph, James Collins, Mark Noble, Manuel Lanzini and Diafra Sakho for Adri�n, Reid, Edimilson Fernandes, Feghouli and Fletcher. The poser for United as the second half began was whether they could turn their dominance into a win, after failing to do so against Arsenal, Burnley , Stoke City and Wednesday night�s opposition at the weekend. An answer came, within three minutes. Antonio Valencia, who is rejuvenated under Mourinho, cleverly found Mkhitaryan and he showed intelligence to pick out Martial, who rocketed the ball into the roof of the net. Rooney collected a fifth domestic booking of the season, which rules him out of Sunday�s trip to Everton, before Martial scored again to raise his season�s return to three. Valencia claimed the assist. The rest of the tie was played largely in an atmosphere of relaxed conviviality, though Rooney received a Reid boot to the face in the area that left him bleeding, and screaming for a penalty that should have been forthcoming. Even Bastian Schweinsteiger was given a first appearance under Mourinho. That was greeted by ironic cheers around Old Trafford but there was nothing comical at all about United, as Ibrahimovic�s second in stoppage time proved. Bilic was certainly not amused by his side�s performance: �I�m disappointed, you can�t make a slow start here,� said the West Ham manager. �At half-time when we were back in the game I said we cannot make the same mistake again, but we did. Exactly the same start to the half.